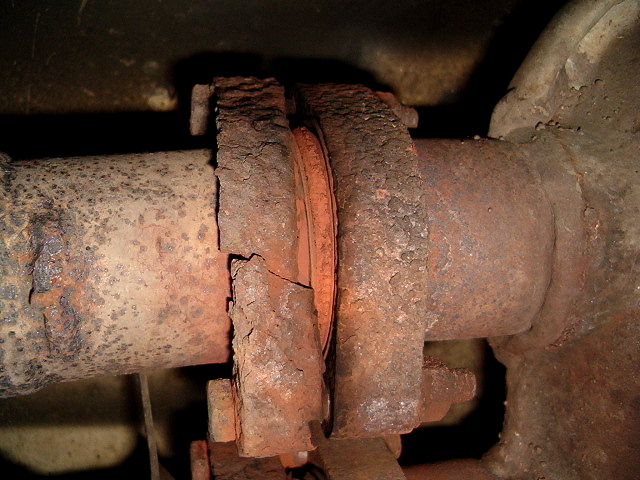 A broken flange belonging to the left pipe of the catalytic converter. This is fine since you get new flanges together with your shiny new exhaust system. But you can only replace the flanges on the center silence side! If one of your flanges on the catalytic converter side is finished, you are bound to replace your fully functional catalytic converter according to BMW. This is of course not a sensible thing to do. In this guide I will give you an example of an alternative solution (works only on the left pipe exhaust pipe though). The exhaust system on a 535i E34 consists of center silencer and a rear silencer. The center silence is then connected to the catalytic converter with flanges on each side held together with two screws and two nuts per exhaust pipe. A 535i E34 exhaust system in the garden. Closest to the camera is the center silencer and further back the rear silencer. In my case only the flange on the left pipe of the catalytic converter was broken. So this guide will only illustrate how to fix the left pipe. The right pipe does look a little bit different since the two pipes to be connected does not have the same diameter. 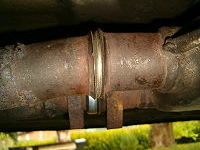 A broken and rusted flange used to hold together the catalytic converter and the center silencer. 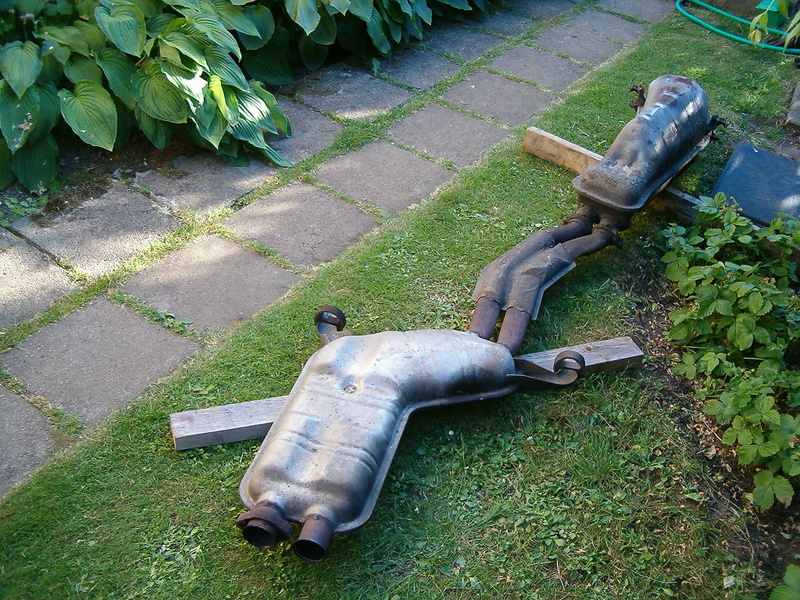 The connection between the catalytic converter and the center silencer for the left pipe is very straightforward. Two pipes of equal diameter, each with a lip at the end, and in between them a simple gasket ring to seal. Everything is held together with two flanges, two screws and two nuts. The left pipe of the catalytic converter and the center silencer meets with a gasket ring in the middle. The repair procedure starts with removing the old and rusty flanges. 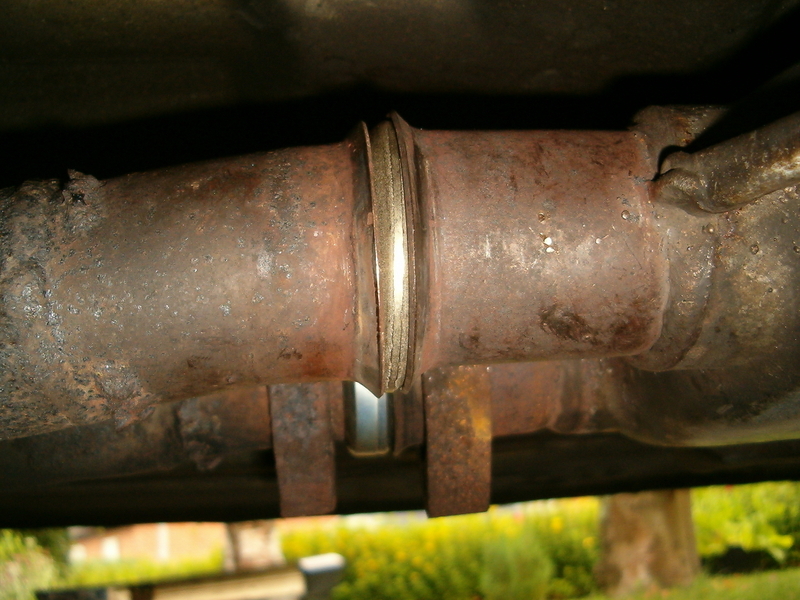 Use a metal saw or an angle grinder to remove both flanges (be careful not to cut in the exhaust pipes). I also removed the good flange on the center silencer side since I didn't have any use for it anyway. Next step is to check if the gasket ring has to be replaced. 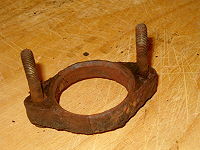 If the flange have been broken for a while you usually need to replace the gasket ring. But I recommend to replace it anyway, it's a minor expense and you know it will make a good seal. 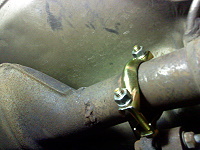 The substitute clamp in place holding together the left pipe of the catalytic converter and center silencer. As the last step simply mount the substitute clamp around the two exhaust pipe ends (with the gasket ring in the middle). Tighten the screws and you are finished!